Because it can be a useful way to build brands while raising capital to open up a brick/mortar brewery, I get asked about contract brewing frequently. As you know, there are three levels of jurisdiction governing the production and sale of alcoholic beverages: federal, state, and local. As you also know, there are three tiers within the beverage-alcohol industry: supplier, wholesaler, and retailer. If you plan on contract brewing, you will be operating on the supplier tier. Just in case you haven’t read Distribution 101, I will explain generally how alcohol distribution works in Georgia, because this discussion won’t make sense without such a basic understanding. To start, every supplier must designate one wholesaler as the exclusive wholesaler for each brand for each territory in which the supplier’s products will be sold. There are two primary aspects to alcohol distribution in Georgia: (1) the regulatory designation, and (2) the distribution agreement. Regulatory designation: Every supplier who sells alcoholic beverages to a Georgia-licensed wholesaler must designate with the Georgia Department of Revenue (“GDOR”) on an ATT-104 form the brands it is designating to a particular wholesaler for a particular territory. Once designated, aside from a voluntary release from the wholesaler, the only way to terminate the regulatory designation is via a proceeding before the GDOR called a Notice of Intention to Change Wholesaler. You see, in Georgia, a supplier must have cause to terminate its relationship with its designated wholesaler. Distribution agreement: A supplier and a wholesaler can enter into a distribution agreement – a contract governing the relationship. The agreement will provide terms regarding case depletion targets, marketing and product promotion, and termination, among many others. While termination of a distribution agreement will not automatically terminate the regulatory designation, the termination provisions can be aligned with the for-cause provisions in the Georgia regulations governing a Notice of Intention to Change Wholesale, which better positions the supplier should it want to terminate the relationship. According to the TTB, a contract brewing arrangement is a business relationship in which one person, such as a wholesaler or retailer or a brewer, pays a brewing company, the “contract brewer,” to produce beer for him or her. The contract brewer is entirely responsible for producing the beer, keeping appropriate brewery records, labeling the beer with its name and address, obtaining necessary certificates of label approval (COLAs), and paying tax at the appropriate rate upon removal of the beer from the brewery. The contract brewer retains title to the beer at least until the beer is taxpaid or removed from the brewery. The TTB considers contract brewing arrangements to be ordinary commercial arrangements. If this person on whose behalf the beer is brewed under contract resells the beer to a wholesaler or broker, then that person must hold a federal basic permit as a wholesaler under the Federal Alcohol Administration Act, and must comply with all applicable special tax requirements. Product flow: The Brewer will produce a specified amount of the Brand Holder’s product, package and label such products, apply for Certificate of Label Approvals (COLAs) for such products, and make available for pick up by or deliver to the designated Georgia-licensed wholesaler(s). The Georgia-licensed wholesaler will, in turn, deliver the product to retail outlets in its territory. 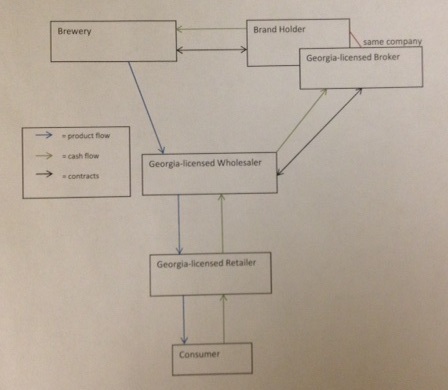 Cash flow: The Brewer will sell the product to the Georgia-licensed broker (the Brand Holder and Georgia-licensed broker are the same company). The Georgia-licensed broker, will, in turn, sell the product (without ever actually taking possession/custody of it) to the Georgia-licensed wholesaler who will, in turn, sell the product to retail outlets in its territory. The retail outlets will, in turn, sell the product to consumers. Thus, the Brand Holder/Broker will make money (hopefully) on the sale of the product to the wholesaler. Contracts: The Brand Holder will enter into a contractual arrangement with the Brewer. Per this arrangement, the Brewer will produce a specified amount of the Brand Holder’s product, package and label such products, apply for Certificate of Label Approvals (COLAs) for such products, and make available for pick up by or deliver to the designated wholesaler(s) in exchange for a negotiated amount of money. The Brand Holder may license its name to the Brewer to be used as a dba so that when the Brewer applies for the COLAs it can do so under the Brand Holder’s name – this is done so that the small print on the label will say the name of the Brand Holder rather than the Brewer. The location or site of production listed on the label is usually the location of the Brewer. For instance, if, say, Thomas Creek Brewery brewed your product, the label would say “Thomas Creek Brewery, LLC – Greenville, S.C.” If you licensed your brewery’s name (say, Best Beer Ever, LLC) to Thomas Creek, however, the label could read as, “Best Beer Ever, LLC – Greenville, S.C.” See a note on this idea below. The Georgia-licensed broker will have to designate with the GDOR the brands to a Georgia-licensed wholesaler, and the Georgia-licensed broker may, additionally, have a distribution agreement with the wholesaler. It is highly advisable for the Brand Holder, as the holder of a Georgia’s Broker’s license, to enter into a distribution agreement with its wholesalers (assuming the wholesaler can be persuaded to do so). Here’s something to consider when deciding whether to have the Brewer apply for COLAs under the Brand Holder’s name: The craft brewing industry is very much about authenticity. Some consumers may think that the Brand Holder is trying to trick them. 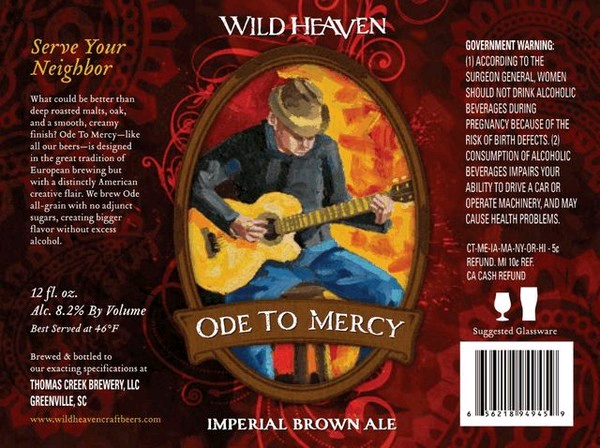 For instance, when Wild Heaven Craft Beers was using Thomas Creek in South Carolina to brew its product, Wild Heaven decided that it seemed disingenuous to not have the brewer listed as Thomas Creek, said owner Nick Purdy. I think this is a good way to convey to consumers that the recipe is yours, while remaining authentic by informing the public that Thomas Creek actually brewed the product. Now, having constructed a brick/mortar facility, Wild Heaven brews out of its brewery in Avondale Estates, GA.
Next up: I’ll explain an alternating proprietorship and how it differs from a contract brewing business model.